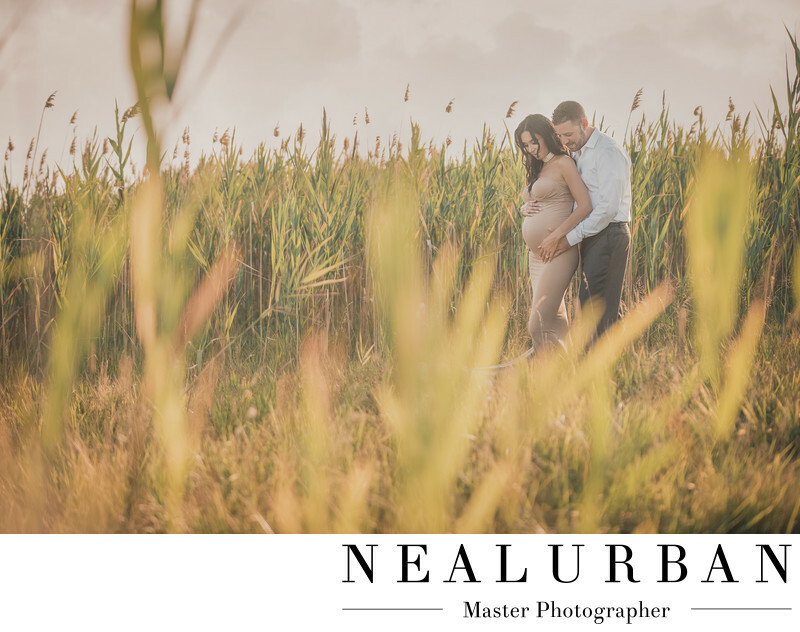 Tift Nature Preserve was an amazing location for Jenna and Artie's maternity session. We had already done engagement and wedding photography for them. They had a May wedding. The ceremony was at Our Lady of Victory Basilica in Lackawanna, NY. The reception was at the Statler in downtown Buffalo. They wanted a simple and airy style maternity session. We suggested Tift Nature Preserve. It has rolling hills and tall grass that sounded perfect for what they were looking for. We had a beautiful sunset for the session too. We actually headed to the Outer Harbor across the street for sunset. But this was done right before then. The sun was hitting this area and making the entire field glow. There was a little path for Jenna and Artie to stand. We positioned them and then Neal got really low in the grass to get this angle. He had to move himself around so the tall grass wasn't completely covering the parents to be. A simple prom pose worked great. Artie placed his hands on the belly and Jenna intertwined hers. Then we had her place her back hand on the top of the bump. A simple glance toward the pregnant belly and that was it! We did not need any added light. The natural light was amazing! At first glance, they look like they are in a corn field. But it is all tall grass and cattails. We love this. We can shoot with some in the foreground to create an artist effect! Then have it in the back ground to balance the photo! Location: 1200 Fuhrmann Blvd. Buffalo NY 14203 United States.